American Petroleum Institute Photograph and Film Collection, Archives Center, National Museum of American History, Smithsonian Institution. Unless your tank is empty, gasoline stations rarely attract attention. Yet, for the past hundred years gas stations have occupied prime locations on main streets and suburban corners, on small town roads, and along early highways. They are one of America’s most common commercial building types and are emblematic of the twentieth century. Surviving historic stations are physical reminders of the transportation revolution and the influence of increased mobility on the landscape. They are a reflection of car culture, pop culture, corporate standardization, and an era of customer service that today seems quaint. Figure 1. Abandoned historic gas stations have in the past been viewed as a hindrance to the redevelopment of a neighborhood or community. Yet sensitive rehabilitations can ensure that the historic character of these buildings is preserved while providing for an economic reuse. This 1930s station in Milwaukee, WI, was later rehabilitated for use as a coffee shop. Photo: Robert Olin, Sherman Perk. Many of these now historic gas stations are deteriorating or abandoned (Figure 1). Changing land use patterns have concentrated new development along commercial strips beyond the downtown and neighborhood locations where many historic stations survive. Interstates have routed traffic away from once-thriving gas stations on what are now secondary roads. Small buildings and small lots, unresolved environmental issues, and a relentless push for standardization are all challenges to the continuing use of historic gas station properties. Across the United States, however, gas stations are slowly being rediscovered for their historic significance. They have even been included on statewide endangered property lists. Once spurned as out of place incursions or eyesores, historic stations are increasingly appreciated for their contribution to the character of a neighborhood, and the way they are easily adapted for new uses. 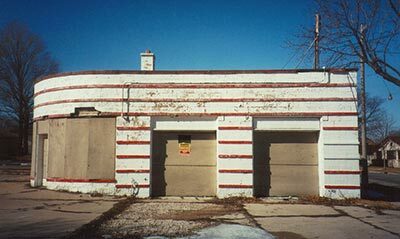 This Preservation Brief provides guidance on assessing the significance of historic gas stations and encourages their preservation by providing information on the maintenance and repair of existing structures. This Brief also describes appropriate rehabilitation treatments, including conversion for new functions when the historic use is no longer feasible. The unique features and characteristics that define historic gas stations can be respected and preserved through sensitive maintenance, repair, and rehabilitation. Such work minimizes unnecessary alterations and ensures that the building continues to contribute to the character and vitality of its community. Figure 2. Although hardly an ideal sales system, pumps and underground tanks along the curb were an improvement over the earliest filling stations where gasoline was poured from hand containers. Photo: Utah State Historical Society, used by permission, all rights reserved. Detached structures built specifically for the sale of gasoline appeared during the second decade of the twentieth century in an effort to meet the petroleum demand generated by the Ford Model T and other affordable automobiles. In the initial race to expand, companies and independent operators constructed basic sheds to serve as drive-in filling stations. Many were rudimentary frame shacks with wood or corrugated metal exteriors. More substantial designs featured prefabricated metal panels, industrial steel windows, and some limited ornament. In either case, the shed was a utilitarian building used for storage and office space, and to shelter the station attendant. Pumps were placed immediately adjacent to the structure or separated on the lot by a driveway where cars parked to refuel (Figure 3). Figure 3. This shed-type station with its prefabriated steel panels, pump island, and canopy prefigured many later gas station designs. Photo: American Petroleum Institute Photograph and Film Collection, Archives Center, National Museum of American History, Smithsonian Institution. While shed stations were often located in central business districts, it was common in rural areas to see gas stations appended to existing structures. Businesses such as restaurants, inns, repair garages, oil depots, and general stores with gas pumps out front were an extension of the original urban curbside gas stands (and precursors to late-twentieth century convenience store and rest stop-gas station combinations). Compared with earlier curbside stands, multiple use stations usually had ample land to accommodate separate drive-in spaces for cars to park while filling up—an especially important feature on higher speed rural roads. Some of these early multiple use stations had the gas retail function located within the existing structure; in other cases, a separate shed or house-type station was constructed on the site. Canopies were an increasingly common feature, extending over the refueling area to shelter the attendant and parked car. Soon canopies came to serve as large signifiers that the otherwise nondescript establishment was a gas station. By the early 1920s, oil companies, distributors, and private entrepreneurs were building new stations on spacious and prominent sites in established residential neighborhoods and in growing communities. As business increased, so did local complaints about the intrusion of gas stations into residential areas. In response the industry adopted conventional forms to make their stations look less like shacks and more like houses. Often with larger customer areas, and increasingly providing public bathrooms and service bays for car maintenance and repair, these stations were more substantial structures than earlier ones. Some were unassuming with simple clapboard siding, wood sash windows, and a pitched (often hipped) roof. The only clues that such structures were gas stations were the pumps, a sign, and the increasingly popular canopy linking the pump island and the building. Figure 4. Designs based on popular domestic forms helped stations blend in with residential neighborhoods while imparting a sense of stability and permanence. 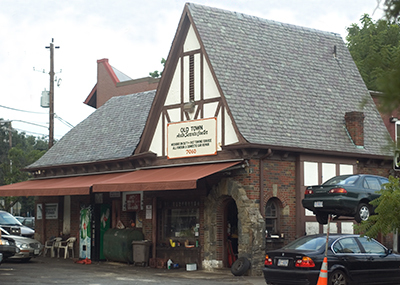 This Tudor Revival station was converted for use as a repair shop with virtually no change to the structure or site. Other stations reflected the period revival trend popular in residential architecture at the time. Colonial Revival gas stations sheathed in brick with white columns, pilasters, double-hung windows, and cupolas were common. Tudor and English Cottage designs featuring casement windows, arched door openings, and steeply-pitched roofs were also popular (Figure 4). Mission Revival stations with hipped roofs and stucco walls were developed by some companies, while others adapted Asian pagoda and temple forms. The move toward the house-type station was also a sign of growing competition within the oil industry as businesses worked to garner customer trust and loyalty. Companies developed distinctive brands and signature building forms. 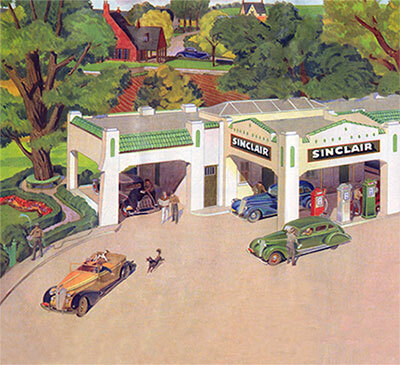 Pure Oil, for example was well-known for its English Cottage stations, while Standard Oil favored Colonial Revival designs. The effort to develop iconic signage and stations foreshadowed all-encompassing branding campaigns that dominated gas station design later in the century. During the 1920s and 30s and continuing after World War II, some gas stations showed a marked contrast to the predominant shed, house, and later box designs. Called programmatic architecture, these stations assumed the fanciful shape of animals, apples, tea kettles, tepees, windmills, castles, icebergs, and airplanes. Appealing to the curiosity of passing motorists, programmatic stations were inspired by local culture, distinctive local materials, or the whim of the owner. Figure 5. This 1936 Shell station in Winston-Salem, NC, is an example of a programmatic design, meant to attract attention and stick in the customer’s mind. It was recently rehabilitated to serve as a field office for Preservation North Carolina. Photo: Preservation North Carolina. Programmatic gas stations could be very modest in size with a shape given over entirely to the object depicted. Shell Oil Company built a number of stations that were little more than sheds in the shape of their logo, the pecten seashell (Figure 5). Colonial Beacon stations in New York State featured three-story lighthouses attached to otherwise unexceptional house-style stations. Equally peculiar, though generally more conventional in form, were the custom-built gas stations faced with unusual materials such as locally-obtained cobblestones, petrified wood, or driftwood. Departing notably from elaborate revival style stations, a new form appeared in the early 1930s, the box station. 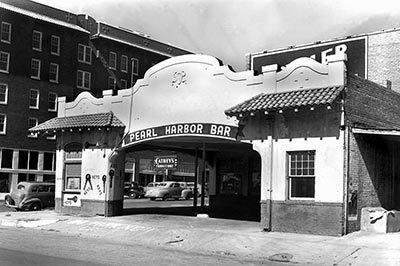 Blending Art Moderne and International Style motifs, box stations featured flat-roofs and unadorned exteriors of stucco, terra cotta, porcelain enamel steel, or structural glass panels. With their glossy white exteriors and scientifically-designed lighting schemes, box stations were meant to attract attention. These stations reflected the increasing importance petroleum companies placed on standardization and predictability. As with earlier house-type stations, companies introduced variations intended to provide designs with a visual identity that customers could easily associate with a particular brand. The use of glass and porcelain enamel presented a futuristic image of modern efficiency, cleanliness, and professionalism. Texaco, Socony, and Gulf, among others, relied on these up-to-date box forms because they were easily replicated, were relatively low maintenance, and functioned as elegant, yet affordable showcases for their products. The form and layout of box stations were also influenced by current economic conditions. Pushed during the Great Depression to explore other revenue streams, station owners added service and repair bays (emphasizing the characteristic rectangular footprint of box stations) as well as expanded sales areas to market lucrative car tires, batteries, and accessories. Large display windows and glazed service bay doors highlighted these products and services (Figure 6). After World War II, the rectangular box remained the primary American gas station form. Structurally, most postwar box stations were made of concrete block rather than the steel frames common among prewar box stations. To distinguish their establishments from others down the street, owners and companies began to vary this basic form as well as retrofit existing box stations to incorporate contemporary design trends. Display windows were often canted at an angle reminiscent of the tail fins sported by rockets and new automobiles. New canopies featured raking profiles, folded plate roofs, and boomerang-shaped supports reflecting a popular interest in aeronautics and high technology. Figure 7. During the 1960s existing box stations were often remodeled and new stations were designed with Colonial Revival or Ranch house details. Photo: American Petroleum Institute Photograph and Film Collection, Archives Center, National Museum of American History, Smithsonian Institution. Such space-age designs were relatively short lived. As in the past, changing architectural tastes and public complaints about the incompatibility of gas stations with their residential neighbors led station owners back to more conservative approaches. By the 1960s new stations with gently sloping shingled roofs, brick and stone facades, and period revival details appeared on what remained essentially rectangular box forms. Existing modern box designs were retrofitted with traditional features and ornament, fabricated increasingly of aluminum or molded-plastic (Figure 7). Although form and decoration vary, most historic gas stations share a number of features that help define their character. These features can identify a particular structure as belonging to a common gas station type, like the clinker bricks used on Tudor house-type designs. Alternately, features may accentuate the uniqueness of a particular structure, such as a custom roof design or circular plan. Some features were highly unusual when first adopted, later became unexceptional, and today are once again rare and distinctive. 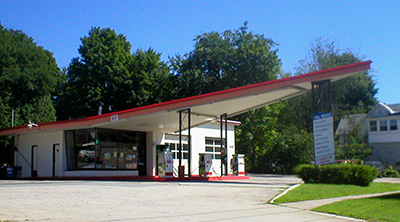 A prime example is the V-shaped canopy found on postwar Phillips 66 gas stations (Figure 8). Figure 8. 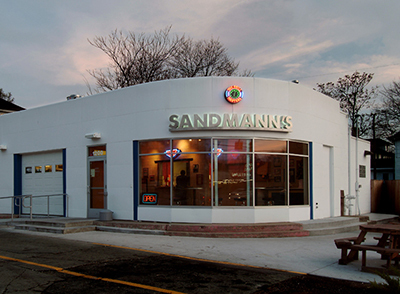 This former Phillips 66 gas station in Burlington, VT, sports a quintessential stylized box design. Its space age canopy is visible from far down the road. Photo: Devin A. Colman. Historic features that contribute to the character of a gas station should be preserved. Features that may not be original can, if they remain in place for a sufficient period, acquire significance. It is necessary, therefore, to determine not only how a structure appeared when first constructed, but how it changed over time. Understanding the history and evolution of a particular gas station and identifying its important characteristics are the first steps in any rehabilitation project. Archival photographs, original plans, newspaper clippings, personal scrapbooks, records, and reminiscences, as well as surviving physical evidence, can provide information about a building’s earlier appearance. Informed decisions about reconciling new functions with the retention of historic features, and about the possible removal of later additions, can only be made after important features are identified and understood. A gas station’s structural form is of central importance. The outward appearance of a historic gas station—its size, shape, massing, and scale—often reflected a particular locale; it gives the historic property its identity; and contributes today to a public understanding of when and why it was constructed. Diminutive structures functioned as no-frills filling stations. Larger stations incorporating other services (some entirely unrelated to the automobile) suggested an ambitious effort to capitalize on a growing community or shifts in consumer demand. The character of the neighborhood and building lot often influenced the gas station designer’s choice of size, architectural styling, or form; in some instances the introduction of the gas station then influenced how the neighborhood developed. The roof’s configuration, pitch, and covering are also important (Figure 9). 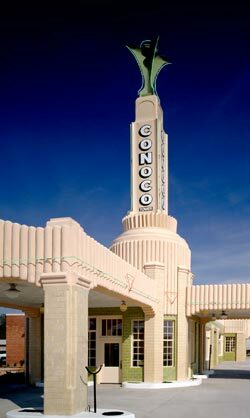 Gas stations designed in the various Romantic revival styles popular during the first half of the 20th century often featured roofs that imitated historic forms. English Cottage stations featured slate roofs, while clay tiles (either rounded or flat and usually terra cotta in color) appeared on the pitched roofs of Mission, Spanish, and Mediterranean Revival gas stations. The 1960s era Stylized Box stations with Ranch house detailing have shallow, often overlapping roof pitches central to the design. Figure 9. 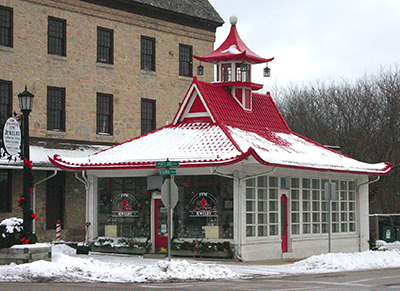 The dominant feature of this former gas station (1929) in Cedarburg, WI, is its pagoda-style metal tile roof (complete with upturned eaves and Japanese lanterns suspended from the cupola). The building currently functions as a jewelry store. Photo: Kenneth M. Itle, Wiss, Janney, Elstner Associates, Inc. While some gas stations were defined, in part, by historicized roofs, others were characterized by the absence of a pitched roof. Flat roofs or very low-sloped roofs concealed behind parapets were common on both articulated contemporary designs, such as glass-sheathed Streamline, Moderne, and International Style gas stations, as well as basic utilitarian boxes. Related to the gas station’s outward form are the materials used to construct and finish it. Exterior materials and cladding help place the structure in a particular time period. Designers and owners selected finishes and building forms that they hoped would convey certain associations in the minds of customers. Brick or stone suggested tradition, stability, and quality, while structural glass and porcelain enamel connoted up-to-date technology, cleanliness, and efficiency. Less distinguished materials could be adapted to a particular stylistic form—exposed concrete block was used on both Modernist and Colonial Revival gas stations. They could also reveal that the structure was built quickly in a strategic location to take advantage of existing traffic and anticipated growth. The casement windows on English Cottage stations and the wrap-around display glass and the steel sash used on side elevations of Streamline designs are examples of how windows can be integral to a gas station’s historic character. As with other features, windows contribute to an overall architectural statement, help date the building to a particular period, and reflect the changing nature of the gas station. The large display windows that first became popular in the 1920s allowed owners to put lubricants and accessories on view while at the same time conveying the positive attributes of transparency and modern efficiency. Appearing between the World Wars, Colonial Revival stations with their double-hung and small divided-light windows presented a reassuring sense of tradition and dignity. Doors and entrances are likely to be significant, especially those on primary elevations. Perhaps the most important openings found on historic gas stations are the service bay doors. Surviving gas stations from the early-twentieth century may still have their folding or sliding doors. The majority of historic stations, however, likely feature segmental doors that were guided by wheels set into tracks. When first introduced these overhead doors were largely wood. Successive door models featured more numerous and larger glass lights. By the postwar era, overhead metal doors with fully-glazed panels predominated. Whether they date from 1916 or 1965, basic gas station sheds often contained a single room. Other modest stations usually had a sales area that included product displays and a counter. Depending on the structure’s size, additional rooms may have opened off of this space, including an office, restroom, storeroom, and boiler room. When separate restroom facilities were provided for both genders, entry to the ladies room was traditionally provided through an exterior door. Service bays were typically connected to the sales area and sized to accommodate the repair and maintenance of one to four cars at a time. These open spaces featured tire racks and built-in shelving to store tools and parts along the sides and rear. When hydraulic lifts replaced below-grade repair pits, new service bay heights increased accordingly. Over time, the sales floor area generally increased as owners realized the profit potential of products from windshield wiper blades to snacks and soda. A gas station’s interior, including room partitions, decorative moldings, floor and ceiling surfaces, ceiling fixtures, and built-in furnishings like shelves and counters may contribute to the building’s historic integrity. By understanding the structure’s evolution and history of past alterations, existing interior features can be evaluated as to their relative significance. Either self-supporting, or more commonly extending from the main building across to the pump island, canopies sheltered attendants, customers, and pumps from inclement weather. They also provided prominent space to emblazon with company names, colors, and logos. They embellished an otherwise nondescript block building and could carry over an aesthetic theme such as sculpted streamline curves or boomerang angles (Figure 10). For a modest or nondescript station, the canopy may have been a dominating feature. Often the canopy functioned as both shelter and sign. Sweeping out across the filling aisles and coming to a sharp point, supported by an open web post or cantilevered to appear weightless, canopies worked to attract the attention of passing motorists and stand out on cluttered commercial strips. Gasoline is essentially a non-differentiable commodity; customers rarely see it and rarely notice a difference from one brand to the next. To establish a recognizable identity, companies have long tied their products to specific logos and signs. Texaco’s star, Shell’s pecten, and Mobil’s pegasus are well-known examples. Other symbols and lettering, from those found on defunct franchises to neighborhood establishments with names painted directly on the brick, are less familiar, but often have local significance. Logos, stripes, and other color schemes all worked to brand the structure and signal to passing motorists a desirable place to stop. When the station was a simple rectangular box, its signs were all the more important in attracting customers. In addition to the main structure, historic gas station sites typically included free-standing signs, pump islands, driveways, parking areas, and landscape plantings. They may also have featured a detached repair garage (if it was not appended as the station’s service bay), other outbuildings (for car washes and other services), storage sheds, and distinctive lighting units. Gas stations along highways and at rural crossroads were often part of a larger setting that was home to similarly-themed restaurants, general stores, and occasionally motor lodges, inns, or cabin courts. The significance of a historic gas station is derived not just from its form and appearance but also its physical make-up of historic materials. The best preservation strategy is one of continual maintenance and repair that takes into consideration the historic character of these materials and forestalls more significant intervention. Regular maintenance helps preserve these materials and extends their useful life. Most of the materials found on historic gas stations, from slate, tile, and even composition roofs, to brick, concrete, stone and wood siding walls, are common to countless other older buildings. Whether dealing with a house, store, office, or gas station, a primary maintenance priority is to prevent unwanted water infiltration and the damage that can result. This includes making sure exterior joints in wood and masonry walls are properly sealed and that the roof is maintained. Gutters and downspouts should be cleaned regularly and kept in sound working condition. Another common maintenance principle especially relevant to gas stations is that historic building materials should be cleaned using the gentlest means possible. When considering chemical cleaners, first test the product’s effect on a small inconspicuous location of the building. Harsh, abrasive cleaners should be avoided. Regular repainting of wood that is exposed to the weather, such as doors and windows is a well-established, cost-effective maintenance principle. Figure 10. The canopies on this 1936 gas station in Shamrock, Texas, are both functional and integral features of the station’s overall design. This building was recently converted for use by the local Chamber of Commerce, partially with FHWA Transportation Enhancements funding assistance. Photo: Mark Trew Photograpy. Box-type stations built between the 1930s and the 1960s were often finished with distinctive panels that deserve special attention. Porcelain enamel and structural glass wall panels originally offered the promise of durability and low maintenance as they purportedly were easily cleaned and never required repainting. However, these walls can be damaged by impact, harsh cleaning methods, and infrequent maintenance of the joints between panels. As with maintenance procedures, the repair treatments prescribed for historic gas stations are in most respects the same as for any historic structure. Such work may include incidental repairs to fix weather or impact damage, or may be part of a larger rehabilitation project. (An overview of common repairs undertaken as part of a rehab project is also included in the Rehabilitation Considerations section of this Preservation Brief.) Appropriate repairs to a historic gas station adhere to the following guidance. 1) Deteriorated historic features should be repaired rather than replaced where possible. The historic integrity of a gas station is embodied not only in its design but also in its material. Whether exhibiting special craftsmanship, innovative uses of materials, or mass-produced products, the building fabric helps convey the history of the building. The visibility and significance of a building feature that is deteriorated will influence decisions as to repair or replacement. While repairing historic fabric is recommended over replacement, there are features such as flat composition roofs where visibility is not an issue and thus repair or replacement decisions can be based largely on service life, extent of deterioration, and cost. Alternately, a tile roof on a Mission Style station will be readily visible. The cost of replacing that deteriorated roof with tile may not be financially practical for a particular project and alternatives such as asphalt shingles will not match the historic appearance. Fortunately in most instances, tile roofs can be repaired and the service life of the historic roofing extended. Figure 11. The porcelain enamel facade of this former Texaco station (1960) had numerous dents and scratches that had exposed the steel beneath the enamel to deterioration (top). Rehabilitation work included repairing localized damage to the panels and blending patched areas to match adjacent historic material, replacing sleepers beneath the panels (center), replacing severely damaged panels with like material, and recaulking the joints (bottom). Photos: John Vaughan, Architectural Conservation Services. 2) Part of the character of any historic property is that it shows age. Small dents in tin ceilings and worn door edges are simply a reflection of use and often do not require intervention. A larger hole in a tin ceiling or a broken panel in a door can be corrected without replacing the historic fabric. Marine epoxy can be successfully used on metal ceilings to fill holes resulting from former light fixtures or ceiling fans, while a good carpenter can easily replace broken panels on a historic wood door. 3) When undertaking repair work on a historic gas station, contractors or craftsmen experienced with historic materials and work on older buildings should be selected. From masonry repointing and tin ceiling repair to work involving more specialty material such as plastic molded panels and porcelain enamel and structural glass panels, selecting the right contractor will save money in the long run and more importantly will help insure that the work will be appropriately done. Porcelain enamel offers a good example of some of the problems and the level of skill and experience that may be required when repairing historic materials (Figure 11). Spot repairs of damage (drill holes, impact damage) to these types of manufactured panels are challenging. Because the original glass-like finish was baked on at a high temperature, it is hard to adhere filler and paint to the enamel surface; blending new material with the original surface color is particularly difficult. The preferred, least intrusive, approach is to remove any rust, fill any depressions with a marine epoxy filler, prime, and repaint the surface with a high-quality glossy enamel. This paint coating will likely require a renewed treatment after some years. More severe damage may require replacement with a salvaged or newly fabricated panel. Where panels are loose or select ones need replacement, care should be taken during disassembly as they often are supported by an attachment system that requires a specific sequence of removal and reinstallation. “Rehabilitation” is “the process of returning a property to a state of utility, through repair or alteration, which makes possible an efficient contemporary use while preserving those portions and features of the property which are significant to its historic, architectural, and cultural values.”2 Gas station operators may feel the need to upgrade their historic property to compete with newer stations. Or owners may stop selling gas and convert the site for traditional gas station reuse activities, from auto repair (exclusively) to used car sales. Some historic stations may be converted to an entirely new commercial, office, or other use. 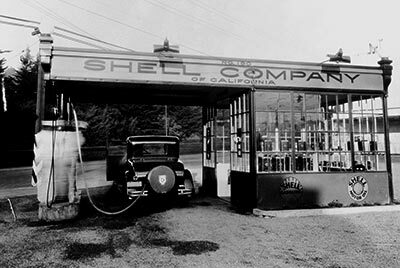 Photographs from the 1930s and 40s show new businesses established in a variety of gas station types (Figure 12). Rehabilitation projects with these three intended outcomes: continuing use, traditional reuse, and unrelated new use, in that order, generally call for increasing degrees of alteration of the historic station. Figure 12. Gas stations have a long history of reuse (and abandonment and reuse again). By 1942 this gas station in Tulsa, OK, was already being reused as a bar. At one time the front island shed (on the left) functioned as a locksmith’s shop but was vacant at the time of the photo. Photo: Library of Congress, Prints and Photographic Division, LC-USW3-9523-D. Historic gas stations are characterized not only by their architecture but also by their function—servicing automobiles and providing fuel for their use. Thus from a historic preservation perspective, retaining that function is nearly always the best use of a gas station. Continuing the same function can also reduce the need to alter the structure, and often avoid a host of issues encountered when introducing a new use. Gas station owners are engaged in a highly competitive business with considerable pressure to update, “modernize,” and incorporate current marketing trends. Large franchises and petroleum suppliers have in recent years shown little interest in tradition and the historic qualities of older stations. However, an increasing number of individual owners of older stations have not only acknowledged the historic importance of their properties but have also taken steps to maintain and rehabilitate them in ways sensitive to the features that make them distinct (Figure 13). Drawing upon customer loyalty, good service, and fair prices, as well as favorable locations, such operators have found successful ways to do business when faced with such potential limitations as small lot sizes, more traditional building interior plans, and a less flashy contemporary look. They help distinguish their businesses by using history as an attractive quality. Appealing to the nostalgia of consumers they retain old signs (in combination with necessary new signage) and emphasize good building maintenance as a reflection of good car maintenance. Figure 13. 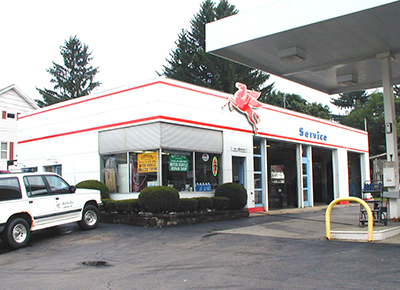 Essentially unchanged since its construction in 1950, this service station in Canisteo, NY, is currently owned and operated by the son of the original owner. Photo: Debra Jane Seltzer. Even the continuing use of a gas station for its original function is accompanied by change—from periodic reworking of standardized petroleum signs to the current emphasis on larger canopies. Alterations are often the result of shifting relationships between station operators and petroleum suppliers, shifts hastened by the trend to mega mergers among the petroleum industry and the rush to rebrand their station outlets. Accommodating larger sales areas, especially for food and carry-outs, has been a challenge confronting the operators of surviving historic stations. Various approaches have been used including placing an addition on a secondary elevation, or introducing an expanded sales area in one or more of the service bays. As in the past, it is common for vacant gas stations to be adapted for use by car-related businesses. Such traditional reuses often require only minimal alterations to the building and site. When an owner decides to discontinue the sale of gasoline and concentrate on auto maintenance and repair using the existing service bays, the only requisite change may be to remove the pump island. Gas stations are easily converted to used car dealerships. The stations’ lucrative corner lots provide parking space and visibility, and their existing sales areas are converted to office space with just a change in furnishings. A more recent trend has been for historic stations to be reused for car rental franchises, again requiring only modest changes to the existing structure. Figure 14. Abandoned gas stations make ideal homes for start-up businesses. 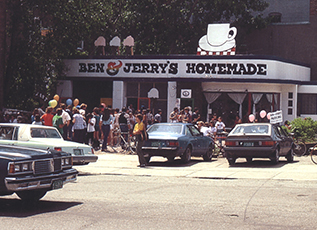 In 1978 the first Ben and Jerry’s Scoop Shop opened in a converted station in Burlington, VT. Photo: Ben & Jerry’s Homemade, Inc. Historic gas stations have shown in the past to be attractive properties for new uses unrelated to automobiles. The combination of clearly-defined sales areas and larger, more open unfinished service bays make historic stations easily adaptable to a variety of functions. In many cases, their locations on intersections and along busy streets remain attractive for commercial use. They are often ideal, affordable sites for start-up businesses (Figure 14). Successful rehabilitation projects have converted historic stations for use as restaurants, cafes, bakeries, medical supply stores, antique shops, visitor centers, and offices for local business organizations and non-profit groups. Service bays have been converted to art galleries, photo studios, seating areas for restaurants, and open office space. Some stations have even been rehabilitated for residential use. As gas stations are increasingly recognized as historically significant in their own right, the need to preserve important features of the historic design when adapting the property to new functions has received greater attention. 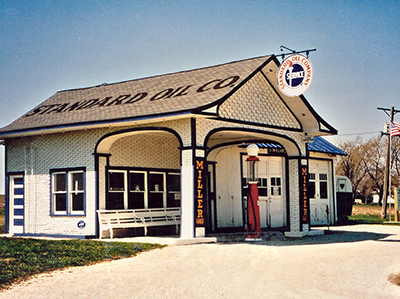 This 1932 Standard Oil Filling Station, located on the original Route 66 in Odell, IL, was purchased by the town and restored by Odell Tourism and Community Development Board, the Route 66 Preservation Committee of Illinois and many other volunteers and contributors. It functions as a museum and visitor center. Photo: John and Lenore Weiss and the Route 66 Preservation Committee of Illinois. 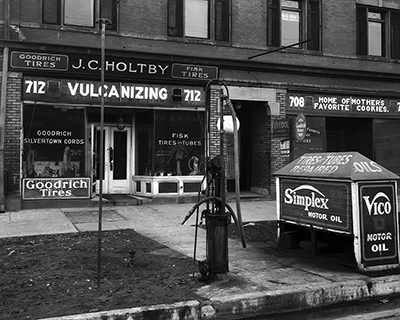 A gas station restoration project depicts the form, features, and character of a building as it appeared at a particular period of time. Restorations involve removal of features from other periods in the station’s history and reconstruction of missing features from the restoration period. The limited and sensitive upgrading of mechanical, electrical, and plumbing systems and other code-required work to make properties functional is appropriate within such a project. In recent years a number of gas stations have been restored for various uses. Occasionally, the property continues to operate as a gas station. It is increasingly popular to restore gas stations for use as museums or history centers, with exhibits on the station’s history, the history of a local community or that of an important adjacent highway. Surviving remnants of historic roads like Route 66 feature gas stations bypassed by the interstate system that are now restored and patronized by tourists and the local community. These restored gas stations often become popular attractions and outdoor meeting places, especially for classic car fans and motorcycle enthusiasts. Depending on the new use, some restorations are complete down to the installation of historic (replica or rebuilt) pumps, signage, and even period products on the sales area shelves. Others have involved a physical restoration of the exterior and interior, but utilize the sales area as a museum or office for a local organization. There are several considerations common to historic gas station rehabilitation projects regardless of whether the structure undergoes a change in use. Well-planned rehabilitation projects are built upon a documented understanding of the property’s history combined with an assessment of its significant surviving historic features—some of which have been discussed in the Understanding Significance section. A rehabilitation should be designed so that it preserves the important characteristics of the gas station, and avoids damage or unnecessary removal of historic features or materials. 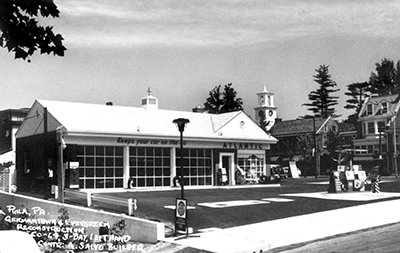 Retaining the form of a historic gas station is an important component of any preservation project. This is especially true of early shed stations and unusually-shaped programmatic designs that derive much of their significance from their form. The latter can be particularly difficult to alter sensitively without diminishing their historic significance. Throughout a rehabilitation project, modest structures should remain modest; box-shaped buildings should remain boxes, and extended, rectangular structures should retain their shape. On many larger gas stations it may be possible to construct a modest addition as part of a reuse project. Successful additions are appended to secondary elevations, preferably the rear. Such additions should be smaller and no taller than the existing structure, be compatible with the original gas station’s shape, and be similar yet distinguishable from the historic construction. Enclosing the outside area beneath the canopy with solid or glazed walls as a means of obtaining additional interior space will significantly alter the character of the property and should not be undertaken. It is recommended that surviving historic roofs that are highly visible be repaired, and when necessary replaced, using the same material. In some cases, new roof products that accurately replicate the color, texture, shape, size, thickness, and profile of historic tiles and shingles may be suitable for use as replacements. Asphalt shingles are rarely an appropriate substitute for historic clay tiles or for slate or wood shingles where the roof is a distinctive feature of the building’s design. An addition with a pitched roof would not be compatible with a historic flat-roofed Modernist or utilitarian structure. Sensitive rehabilitation projects favor historic window repair rather than replacement whenever possible. Gas station windows traditionally were made of wood, steel, and later, aluminum. Excepting sheet glass display windows, they usually featured operable sash. Wood and steel windows may require repair work beyond painting and reglazing. Repairs to damaged wood members (sill, frame, sash, or muntin) are typically undertaken by an experienced carpenter utilizing a wood dutchman or, where appropriate, through application of a wood epoxy treatment. Steel windows can often be repaired as well. It may be necessary to replace one or more windows either because they are too deteriorated to be repaired or because they are second generation windows that are incompatible with the building’s historic character. A new stock window may be acceptable on a rear elevation provided the window is sized to fit the existing opening. Windows that require replacement on the front and prominent side elevations obviously require more attention to historic detail, carefully matching the design, shape, and appearance of the historic units. Doors to the sales office, service area, and restrooms entered from the outside were made of either wood or metal (steel and later aluminum). Methods for repairing historic doors again follow traditional carpentry or metalwork methods. Often the existing doors are not original. If they need to be replaced, new doors should be compatible with the historic character of the building. Where the historic door opening is not a standard size, a custom door can be made to fit rather than blocking the opening to fit a stock door (see the discussion of ADA requirements below). Key features of doors should be identified, including the ratio of glazing to solid material in the door; whether a door traditionally had panels or was glazed; whether a door exhibited certain features reflecting the building’s specialty design, and the degree of setback within the opening. Fully glazed doors should not be replaced with stock paneled doors purchased at a home improvement store. Figure 15. The historic restroom door to the right of the display window was closed off (and entry provided on the inside) when this former gas station in Grand Rapids, MI was converted to a carry-out restaurant. A flush panel was recessed in the opening to identify the historic location of the door. Photo: M Buck Studios. If a historic door opening is no longer needed and the opening is on a main facade, either the existing door or a matching new one can be fixed in place. Since former restroom exterior doors tended to be on the side of the building, it may be possible to infill the opening in an appropriate manner. This is accomplished by recessing the new wall within the existing or new door frame (Figure 15). Avoid placing infill material flush with the exterior wall in a manner that would erase evidence of the former restroom door opening. Service bay doors are often among the most prominent features of a historic gas station. Except for the earliest versions, service bay doors typically featured a grid configuration of solid or glass panels. By the 1940s it was not uncommon for the glass panes used in these panels to extend in rows from the bottom to the top of the door. Where wood doors have survived, they can usually be repaired using regular carpentry methods, sometimes augmented by epoxy applications. Segmental overhead doors made of aluminum or steel were the most common service bay door type from the 1930s on. If a historic overhead door survives it should be repaired whenever possible. If the existing service bay door is a later replacement that is compatible with the historic character of the building, there are the options of retaining or replacing it with one of a similar compatible design or with a reproduction of the historic door. For a further discussion of rehabilitation options, see Service Bay Doors. This 1938 concrete block gas station featured a pair of wood multi-light segmental service bay doors (top). When the station was converted to a coffee shop the service bays were reused as a dining area. The doors were fixed in place and a door for customers was introduced in the right opening in a manner that retained the original light configuration (above). To increase the thermal properties of the service bay doors, the single pane glass was removed and replaced with insulating glass (below). The appearance of the door is virtually unchanged and the building retains its historic character. Drawings courtesy Robert Olin, Sherman Perk. The earliest service bay doors featured wood sliding, folding, or swinging panels. When such doors are appropriate but the historic panels are missing, door and millwork shops can create custom reproductions. Several manufacturers produce reproduction doors that operate as overhead doors, yet have the appearance of traditional folding doors with inconspicuous breaks in the horizontal sections and vertical shadow lines replicating the original panel configuration. As historic service bay doors were typically utilitarian in appearance, appropriate stock replacement doors are generally non-descript in design. Beginning in the 1930s stations increasingly used segmental overhead doors. Surviving doors can usually be retained and, if need be, upgraded as part of a rehabilitation. It may be possible to replace the existing single-glazed panels with insulated glazing and wood panels with insulated panels while retaining the original door structure. Such treatments may be particularly necessary when the former service bays are used as offices or dining spaces. Fixing a historic door in place is preferable to enclosing the opening with new construction. If a historic sectional door is deteriorated beyond repair, a replacement should be selected that matches the materials, panel profile, glazing configuration, and visual characteristics of the historic door. New overhead doors are generally available through commercial sectional door manufacturers. Because contemporary doors can be custom ordered with a variety of glazing configurations, it is relatively easy to match the appearance of a particular historic service bay door. Today’s sectional doors are often made of inner and outer layers with an inner core of insulation. Contemporary aluminum door construction differs little from historic units—the primary distinction being a tendency in today’s units to have narrower rails and muntins. If the historic door does not survive, a replacement in keeping with the form typical of the building construction, style, and period should be selected. Replacement doors with raised panels or decorative glazing should generally be avoided as they present an appearance at odds with the basic flat panels common on historic service bay doors. Figure 16. 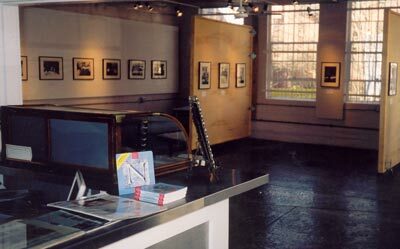 A postwar Stylized Box-type station in Newport, RI, was rehabilitated and converted to an art gallery. The service bays (here showing side and rear walls) provide open gallery space while the small sales area (left) continues its historic retail function. Every effort should be made to retain and, when necessary, repair historic interior features that characterize the gas station. A range of new functions can be accommodated within the historic form and interior layout without altering the overall character of the space. Some projects require no change to the interior. If a gas station is rehabilitated for continued use as a gas station or is reused for an auto detailing shop, for example, significant alteration to the interior may be unnecessary. Some new functions— satellite police stations, tourist offices, drive-thru coffee shops, and galleries—may also require only limited alteration of interior spaces (Figure 16). Larger structures with service bays are easily adapted for retail and restaurant uses. Restaurants inserted into former gas stations often locate the kitchen and counter area where the sales and rear office area used to be; the service bays function as the dining room and are left undivided. Historic service bay doors can be retained and upgraded for energy conservation. If kept operable they can be opened in warm weather to provide the feel of outdoor dining. Another common reuse is to convert the station to offices. The original sales area becomes a reception room, private offices are located in the rear, and the former service bays are converted to an open plan office. It may even be possible to retain the original sales counter as a reception desk. The typical configuration of enclosed sales and office areas connected to larger, open service bays can accommodate a variety of new uses. In all cases, the distinction between the various historic interior spaces should be maintained and carried over to the new layout. If a particular reuse scheme requires extensive interior alteration, giving the space an entirely new character, it is likely that the new use is not appropriate for the historic building. When a rehabilitation is substantial or when the rehabilitated building will be open to the public, it may be necessary to make some alterations in order to comply with the Americans with Disabilities Act (ADA) and local building code requirements. If the floor is uneven from room to room, as when the office or sales area steps down into the service bays, it may be necessary to install a ramp that slopes between the different grades. When the difference in height is only a few inches and the historic floors are nondescript, another approach may be to raise the entire lower floor to match the position of the higher level. 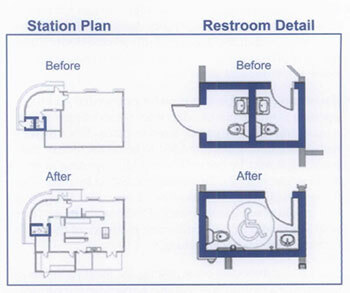 Restrooms are commonly an area of concern when it comes to accessibility. Historic gas station restrooms are small and typically have door openings narrower than those specified in ADA guidelines. Where there are multiple toilet stalls, a solution is to remove one of the toilets and the partition to provide sufficient space. Another common technique is to convert two separate restrooms into a single unisex restroom (Figure 17). When two restrooms are converted to one, the women’s exterior entrance is usually closed off and, if necessary, the interior doorway is widened. It may also be possible to construct new rest room space along the rear wall of the service bay or as a small addition on the rear elevation. This new construction should be designed to blend with the historic structure yet plainly read as a later addition. Figures 18. The canopy of the 1920s Spruce Street Station in Ogallala, NE, was an important feature that contributed to the building’s character (top). When recently purchased for rehabilitation the canopy had long since disappeared (center). Using photographic and physical evidence, the canopy was reconstructed to match the building’s original appearance (bottom). The station currently functions as a Main Street program office, a visitor center (on Nebraska’s Western Trails Historic and Scenic Byway as well as Lincoln Highway Scenic Byway), meeting room, and public restroom facility. Photo: Ogallala Main Street. Because canopies, if present, are central to the appearance and function of historic gas stations, it is important to retain and repair them. Canopies featuring wood or steel beams supported on wood, steel, or masonry piers are rarely difficult to repair. Cantilevered canopies without supports, however, may require more significant intervention where they are connected to the station. Insufficient reinforcement in the original construction and subsequent deterioration can cause the canopies to deflect and damage the main structure. Deteriorated canopies dating from the 1960s that feature custom plastic fascia panels may require replacement pieces molded to match the existing materials. Custom steel trusswork, either in the supporting pier or the canopy itself, if it is deteriorated beyond repair can be replicated with newly-fabricated members matching the existing features. It may be possible to replace missing canopies with new ones based on historic documentation (Figure 18). Aggressive marketing, corporate standardization, frequent changes in suppliers, and frequent changes in use contribute to the ephemeral nature of gas station signage. Still, historic signs occasionally survive a gas station’s varied past and remain on buildings slated for rehabilitation. Depending on the gas station’s new use, signs may be retained as part of a rehabilitation project. When historic signs are missing, check attics, basements, and other storage areas around the site to see if earlier signs may have been removed but not discarded. There are often ways of retaining some elements of a station’s historic signage. However, if logos are still in use by an existing oil company or remain under trademark protection it may be necessary to remove the signs in question. Where the historic signs are missing, replacement signs (available from collectors and dealers in “petroliana” ) can in some cases be used instead. However, the installation of vintage signs not directly related to the original structure should be approached with caution and based on research that identifies similar signage used on the building in the past. Designs for affixing new signage to either a still-functioning gas station or one being adapted for a new use should not damage or conceal the structure’s historic features and finishes. Anchoring the sign in masonry joints, for example, facilitates a secure connection and allows for eventual removal of the sign without affecting the stone, brick, or porcelain enamel finishes. Attaching signs onto or over cornices, moldings, window surrounds, or other decorative features can usually be avoided. During any rehabilitation project, especially when a new function is introduced, care needs to be taken to maintain the relationship between the structures and features characteristic of a particular historic gas station landscape. If a site includes two distinct structures, a sales area and separate repair garage for example, it would be inappropriate to physically join them with a new hyphen as part of the rehabilitation. Historic light poles and other lighting fixtures that are part of the gas station’s design should be retained. Surviving pump islands, if not removed as part of the project, should be retained in situ rather than moved to another place on the site where they were never located historically. The historic ratio of paved area to plantings and flowerbeds should be maintained at a reasonable level. Extensive grass, shrubbery, and other plantings inserted into a rehabilitated gas station site can obscure the main building’s original function and historic context. The US Environmental Protection Agency (EPA) estimated in 2004 that there were at least 200,000 abandoned vacant sites with petroleum contamination in the United States, most of which are gas stations. Since the advent of dedicated gas stations, fuel has been stored beneath the ground, usually in steel tanks. Some stations, particularly those that included service bays, may also have buried tanks for waste oils, lift reservoirs, and other petroleum products. Corroded and leaking underground storage tanks (USTs) can contaminate soil, surface water, and groundwater. Where leaking tanks remain, assessments are made to determine the extent of the release. Based on the proposed end-use an appropriate remediation plan is developed that includes tank repair, removal, or closure along with the necessary cleanup. If the site is to remain a gas station, tanks can sometimes be repaired by qualified professionals using standard industry practices. A program of testing is required after repairs are made to ensure that the tank does not continue to leak. Projects where the new use does not require USTs may call for closure or removal of the existing tank. To permanently close a UST the appropriate regulatory agency must be notified beforehand; all liquids, sludge, and dangerous vapor levels must be removed from the tank; the tank must be filled with an inactive solid like sand, and any necessary site assessment and remedial action must be undertaken. Removal involves taking the tank from the ground, mitigating soil or water contamination and infilling the site. In some cases, depending on the proposed new use, returning the soil 100% to its pre-contamination state may not be required. In addition to environmental damage, the continuing presence of leaking USTs dampens investor interest in reusing historic stations, hinders financing such projects, and perpetuates the existence of abandoned sites that can suppress nearby property values and development. In recent years states have moved beyond just cleaning up and closing underground storage tanks to explore effective ways of integrating these activities with broader plans for economic redevelopment of gas station sites. Municipalities are fostering collaborations with developers and investors interested in specific gas station sites that tie assistance with environmental remediation into a broader plan for neighborhood revitalization. Although it is still common for orphan gas stations to be demolished as part of a UST project, the number of site clean-ups that have included rehabilitating the existing station for a new function has increased. Figure 19. When converted for use as office and meeting space by a local community non-profit, the historic character of this 1960s gas station was retained. Porcelain enamel repairs to this station are illustrated in Figure 11. Photo: Scott Lapham Photography. From their arrival a century ago, gas stations have been among the most underappreciated American architectural forms. This was due in part because of their utilitarian function and their intrusion into quiet residential neighborhoods. Yet the history of gas station architecture is richly varied, incorporating popular trends, unique programmatic designs, and well-known examples of corporate branding. 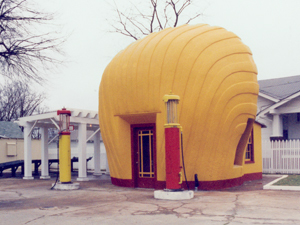 Gas stations were designed to attract attention and lure customers with bold, contemporary themes or to blend in with the surrounding neighborhood relying on forms derivative of residential design. 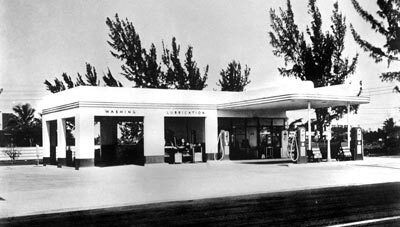 Historic gas stations ranged from one-room sheds to rectangular structures with sales areas and service bays to elaborate one-stop complexes that include restaurants and lodging. When a gas station is rehabilitated today, it is important that its style, form, exterior appearance, interior layout, and site be assessed as to how they contribute to its historic character. Significant features and design elements should be retained during rehabilitation or restoration work (Figure 19). When sensitively maintained or when rehabilitated for new uses, gas stations can continue to contribute to a local economy and provide important services to local residents. As a unique building type, historic gas stations will continue as reminders of earlier eras when the automobile was still something of a novelty, or when every tank of gas came with an oil check and a cleaned windshield. 1. Jakle, John A. and Sculle, Keith A. The Gas Station in America. Baltimore: Johns Hopkins University Press, 1994. In a 1978 journal article, expanded upon in this definitive book, cultural geographer John Jakle identified a gas station typology referenced in most subsequent gas station histories. 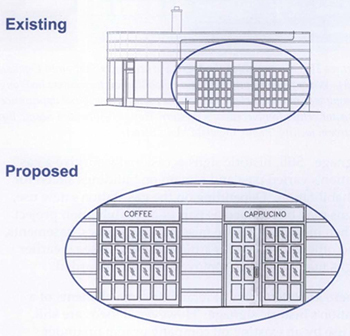 It is adapted in the Historic Gas Station Types section of this Preservation Brief. 2. The Secretary of the Interior’s Standards for the Treatment of Historic Properties. Washington, D.C.: U.S. Department of the Interior, National Park Service, 1995. The author wishes to thank the following for their assistance in the preparation and review of this brief: John Jakle, University of Illinois at Urbana-Champaign; John Vaughan, Architectural Conservation Services; Alison Oswald, Archives Center, Smithsonian Institution; Robert Olin, Sherman Perk; Robert Gamble and Melanie Betz, Alabama Historical Commission; Steven McNeely, Office of Underground Storage Tanks, US Environmental Protection Agency, and Kaisa Barthuli, Route 66 Corridor Preservation Program, National Park Service. Thanks also go to the following Technical Preservation Services staff of the National Park Service: Sharon Park, FAIA, Anne E. Grimmer, Michael Auer, Elizabeth Creveling, and Lauren Van Damme. Charles E. Fisher, Technical Preservation Services, National Park Service, was the technical editor for this publication project. This publication has been prepared pursuant to the National Historic Preservation Act, as amended, which directs the Secretary of the Interior to develop and make available information concerning historic properties. Comments about this publication should be directed to: Charles Fisher, Technical Publications Program Manager, Technical Preservation Services, National Park Service (org. 2255), 1849 C Street, NW, Washington, DC 20240. Additional information offered by Technical Preservation Services is available through our website at www.nps.gov/tps. This publication is not copyrighted and can be reproduced without penalty. Normal procedures for credit to the author and the National Park Service are appreciated. Unless otherwise indicated, photographs are by the author. Excepting the author’s photos, the photographs used in this publication may not be used to illustrate other publications without permission of the owners. Halda, Bonnie J., Preservation Tech Notes, “Doors Number 1, Historic Garage and Carriage Doors: Rehabilitation Solutions” Washington, D.C., National Park Service, 1989. Jester, Thomas C., ed. Twentieth Century Building Materials: History and Conservation. New York: McGraw-Hill, 1995. Liebs, Chester H. Main Street to Miracle Mile: American Roadside Architecture. Boston: Little, Brown and Company, 1985. Preservation Briefs. Washington, D.C.: U.S. Department of the Interior, National Park Service. The collection of Preservation Briefs assist owners and developers of historic buildings in recognizing and resolving common preservation and repair problems prior to work.